One of DeMille's very best films. Doubtless helped by the fact that there was no CGI available in the mid-1950s. In my view CGI is - at best - a very mixed blessing. DeMille's silent 1923 version had spectacular sets for the first half, which is set in Ancient Egypt. It is worth watching for the sets and "cast of thousands." Unfortunately, however, the second half is about two brothers in contemporary San Francisco, and is therefore less interesting. I have watched "Exodus: Gods and Kings", and it managed to drain this story of all its spectacle. It's like doing "Lord of the Rings" but deciding that "no, we'll show that the Balrog was just a big shadow on the wall and not a fire demon after all. That'll make it all so much more credible." I don't believe one word written in the Bible, so to me it's just a very long, gory, nihilistic fantasy tale. But if you're gonna adapt it into a film, give it all you've got, like DeMille did. "The Ten Commandments" had a budget of $13, while "Exodus" cost $140, and is a much poorer movie experience. 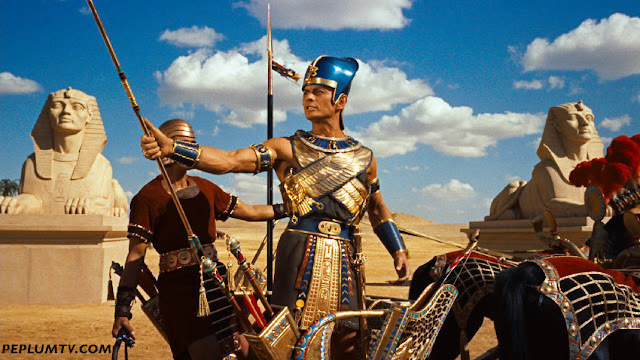 I agree the thrust of what Richard says, although I admit that I have not seen "Exodus: Gods and Kings." However, DeMille's $13 million in the mid-fifties was an enormous amount for the day. Translated into today's dollars, it is probably about the same as the $140 million spend on "Exodus: Gods and Kings." DeMille knew never to save money at the cost of spectacle. When you see a DeMille classic, you observe that a lot of dollars made it onto the screen. Have you heard of the top rating Brazilian soap opera Os Dez Mandamentos (The Ten Commandments)? It was also released as a movie earlier this year and became a huge box office success. Currently, this soap opera is in its second season. Previously, Record TV also produced the peplum series Sansão e Dalila, Rei Davi, A Estória de Ester and José do Egito.